This holiday season, Fernbank Museum of Natural History features several ways to celebrate with fun and unique events. 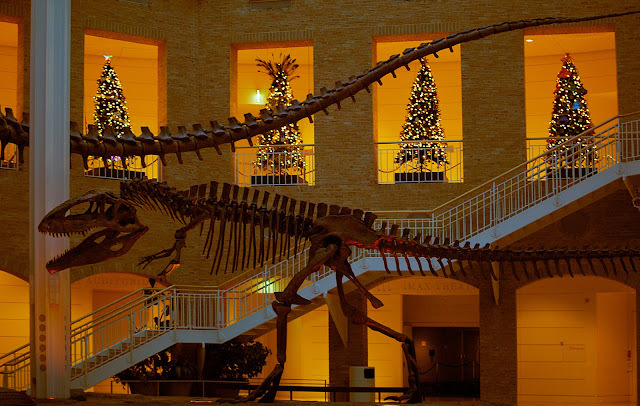 Fernbank’s holiday programming includes the annual Winter Wonderland exhibition, a Winter Wonderland Celebration Day, Fernbank’s Holly Jolly Film Fest, Winter Wonderland evening viewing hours during Martinis & IMAX, and holiday shopping in the Museum Store. On view from November 22, 2013 through January 5, 2014, the fourth annual Winter Wonderland exhibition includes more than 30 festive trees decorated by cultural partners to reflect traditions and holidays celebrated by cultures everywhere. Twinkling with lights, glimmering with color, and shining with a variety of cultural objects, Winter Wonderland: Celebrations & Traditions Around the World recognizes the diversity of celebrations, holidays, traditions and events that cultures recognize here and abroad. Cultures highlighted in the exhibition include cultures from North America, South America, Africa, Europe, The Caribbean, Mediterranean, and Middle East. Special festivities kick off with a Winter Wonderland Celebration Day on Saturday, November 23 from 10 am – 2 pm, where families can enjoy a special day of cultural and holiday-themed performances and activities inspired by Winter Wonderland. The fun continues on Saturdays from November 30 through December 21 with the Holly Jolly Film Fest, hosted by Santa-saurus. See some of your favorite holiday films in Fernbank’s auditorium theater during this special family-friendly celebration. The festival includes film screenings, holiday-themed crafts, giveaways, a Dinosaur Dance Party with Radio Disney, and a chance to take a picture with the holly-jollyest dinosaur of all, Santa-saurus. Fernbank’s Museum Store offers a variety of gift ideas, including dinosaur merchandise, jewelry, activity books, science kits, games, toys, ornaments, and more. The Museum Store’s annual holiday sale offers an additional 10% off store purchases for members only from November 30-December 7, 2013. Adults can enjoy music, films, small plates, a nip from a yuletide toddy and more as they enjoy evening viewing hours of Winter Wonderland during Martinis & IMAX on November 22, November 29 and December 20 from 6:30 p.m.-11 p.m.
All Winter Wonderland activities are included with Museum admission and are free for members. Evening viewing hours during Martinis & IMAX are included with cover charge tickets as well as with IMAX film tickets. The main Museum Store is available for shoppers without the need for a ticket. Museum admission is $17.50 for adults, $16.50 for students/seniors, $15.50 for children ages 3 to 12, free for children ages 2 and younger, and free for Museum Members. Martinis & IMAX prices are $7 for cover charge or $13 for an IMAX® film ticket, which includes a free cover charge. Fernbank Museum of Natural History is located at 767 Clifton Road NE in Atlanta. Tickets and visitor information are available at www.fernbankmuseum.org and 404.929.6300.